Mike McMahon second from left, presents a check to Roger Philippon, dean of planning and public affairs at CMCC, to fund scholarships at the college in memory of his brother Thomas. Others left to right are members of the LHS Class of 1967 who raised the funds for the scholarships: Ron Paradis, Paul Labbe, and Paul Lavoie. 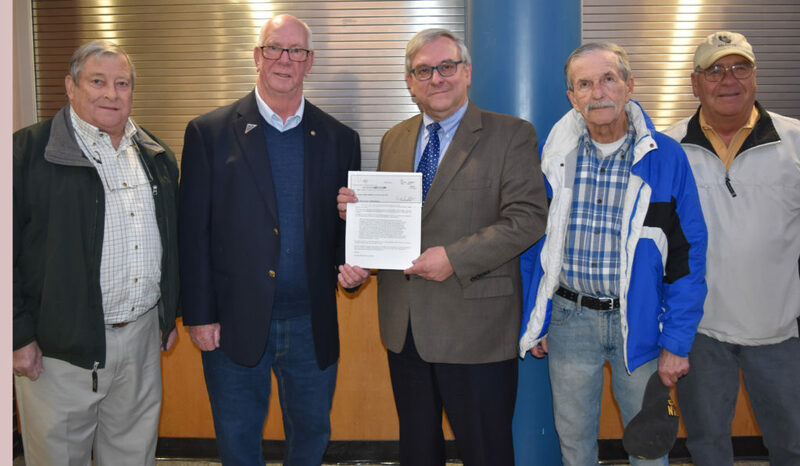 Members of the Lewiston High School Class of 1967 presented a check for $1,500 recently to the CM Education Foundation for scholarships in memory of their late classmate, Thomas J. McMahon. In 1969, Specialist Fourth Class McMahon was serving in Vietnam as a medic when his company came under heavy fire and three soldiers were seriously injured. McMahon left his covered position and ran through intense enemy fire to the side of one of the wounded, administered first aid, and carried him to safety. He was then hit by an exploding mortar round while returning a second injured man to safety. Refusing medical attention, McMahon fell mortally wounded before he could rescue the third man. In recognition of his bravery and service beyond the call of duty, McMahon was posthumously awarded the Medal of Honor, the United States military’s highest decoration. Class members also raised funds to place a granite bench in McMahon’s honor in the Veterans Memorial Park in Lewiston. The McMahon Elementary School in Lewiston is named in his honor.